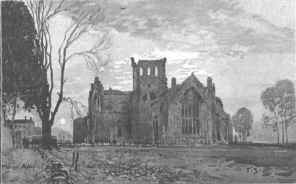 In the Autumn of 1886 I walked with an artist friend through some of the most famous of the Border country, from Moffat eastwards. Upon our return I put together this record of our ten days wanderings. Since then the separate articles have appeared in the pages of various magazines and periodicals. They are now printed under one cover, in the hope that the glimpse which they seek to afford of that romance-haunted region may not be without some general interest, and that the information which they contain, got together from many miscellaneous sources, may prove of use to others who, like the pilgrims of 1886, go Borderwards upon the tramp.